Scott Agnew netted a double. East Fife showed no mercy to poor Forfar as they simply ripped them apart at Station Park. Darren Young's side are on a terrific winning run at the moment, and this was arguably the best of the lot. There was no point at any stage in the game when the Fifers were not in full control. Brett Long was called on to stop a couple of half chances early on but that was as good as it would get for the hosts. There was so much to be pleased with in this win, the clean sheet, the quality of each of the goals and the evident fighting spirit. The rout started in style with a goal straight from the training ground. 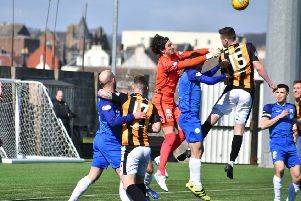 Scott Agnew's free-kick on the edge of the area was floated towards the back post where Kevin Smith had peeled off to and met the delivery with his head giving Marc McCallum no chance. The second wasn't long in arriving, Agnew this time getting his name on the scoresheet with a sublime volley. It was 3-0 and pretty much game over by half time when Rory Currie burst clear of the Forfar defence and finished neatly. One of the impressed spectators in the stand was Currie's Hearts boss Craig Levein. Forfar had hardly posed a threat during the first half and only a horrific collapse would see East Fife fail to pick up the win. They defended well in the opening stages of the second half and with each passing minute the three points became ever more secure. Just to rub further salt in the wounds Agnew added number four with a drive from outside the box. Boss Darren Young said: "Everybody played their part. "We created chances and some of the finishes were brilliant. "It shows you strength of the squad that we could leave out Jonny Court and Anton Dowds and bring in Kevin Smith and Rory Currie who each get a goal. "They've been itching to get on the park. "That's the luxury of having four right good strikers who would get into most teams in the league."